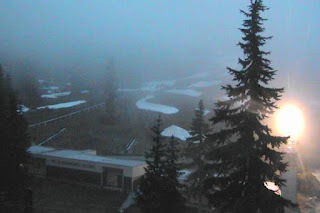 On Saturday, Steven's Pass had its "melt out", which is defined as the first day of the summer when less than two inches of snow water equivalent (SWE) was left on the ground. It was the 8th earliest melt out in the last 36 years. 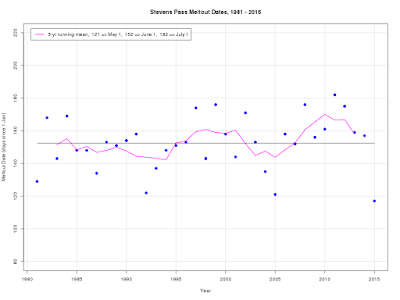 The average melt-out date the last 35 year is June 2, so it is about 1.5 weeks early. Folks care about the melt out date because it is an integrated measure of the depth of the snow pack and the degree of spring warmth, and both of those are expected to be influenced by global warming. Increased levels of CO2 should result in warming that will result in less build up of mountain snowpack in the winter and a quicker melting in the spring of what snow does accumulate. Last year (2015) was a profound example of warming causing a reduction in snowpack and a very early melt off date (the earliest on record!). Some folks are saying that there is trend towards poorer snowpacks and earlier melt-outs, and that that this is an indication that we are already experienced human-caused global warming. But is it true? 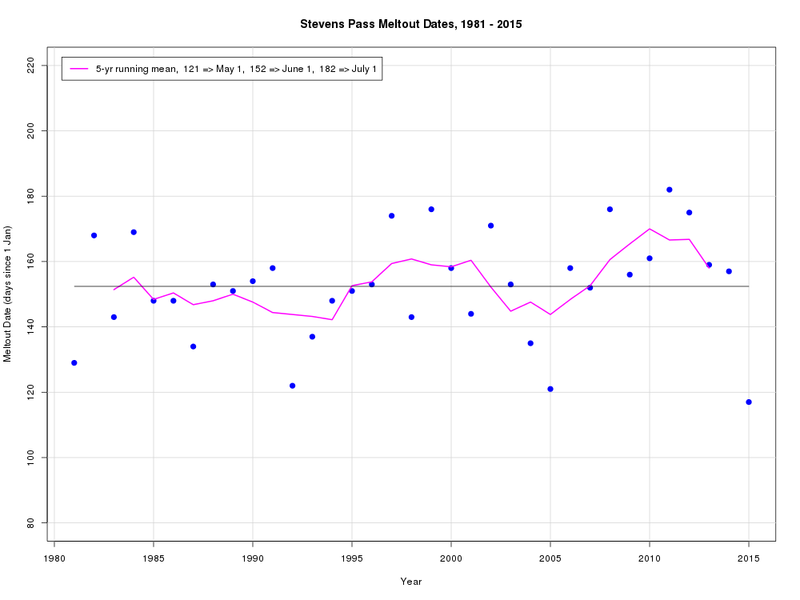 Mark Albright, past Washington State climatologist, has plotted up the Steven's Pass melt-dates from 1981-2015 (see below). The annual melt-out dates are shown by the blue dots, the mean over the period by the horizontal gray line, and the 5-year running mean by the purple line. There is no evidence of a long-term trend for earlier melt-out dates. In fact, just the opposite....melt out dates are trending later (which implies cooling or greater snowpacks or both). Last year (2015) was an outlier, although two other years came close. So there doesn't appear to be any global warming signal producing earlier snow melt offs in our region. To drive this point home further, here are the mean melt-out dates for recent decades (again, thanks to Mark Albright). It appears that the melt-out dates are getting progressively later, just the OPPOSITE of what we would expect global warming would do. This small delay in the melt out is consistent with other independent measures of snow content in the Cascades, such as the April 1 snowpack amount, also show little trend. One or two bad years are not an indicator of a long-term trend and the evidence, as shown above, suggests minimal decadal trends of snow in the Cascades. I think one of the possible reasons Stevens pass has had later melt out dates could be that climate change is supposed to cause warmer temps and more precip for the NW. Stevens pass and the surrounding mountains may be high enough in elevation that the warmer temps do not have as big an affect as the additional precip. Another itsy bitsy sample size. But interesting still. Cliff, Interesting article. How is this observation reconciled with the fact that the north cascade glaciers (and many others) continue to steadily retreat? I know the glaciers started to retreat in the mid 1850's but from what I've read they are a long way from establishing any sort of equilibrium. As an avid hiker and climber I've encountered several new lakes in places where my maps show glacier (yes the maps need updating). Thanks for the graphs Cliff! Very informative. I would be interested in comparing melt out dates with the corresponding PDO and the ENSO as well. My guess is La Nina is later, El Nino earlier. Also, I wonder what influence solar cycles play if any at all. Another marker would be to compare Stevens Pass with other mtn. locations around the West. Thanks for sharing the facts and not pushing AGW hype that is so prevalent in the media. I did the same with the wsdot Snoqualmie Pass snowpack data earlier this month and it showed the same thing. Interestingly, the snowpack at the end of March was almost the same depth on a 5-year running average (and that included last year’s major anomaly) year over year (through year 08/09 was 81.5 inches compared to 81.3 through 15/16), but jumped from 45 inches on average at the end of April 08/09 to 57 inches (again, 5-yr running average) at the end of this year. We had some big years in there between 2011 and 2013. If we continue to see the outcome of the last two years this will begin to change, but reading the data this has happened before (2002-2005 was a similar period), only to be followed by years of above average snowpack. It is something that should not be brushed under the rug as if it did not happen. It did. Kudos to ethical people like you and Mark for speaking the truth. I had the same thought as Josh. While the data you showed supports that there has been no trend in melt out dates at that location, and while this is a useful first look at this question, data from one location is clearly not enough to make strong conclusions about what is happening in the region as a whole. I am wondering whether studies have been done with more comprehensive sampling at different elevations and aspects etc. that would give a more definitive answer to the question of whether one can see a climate change signal in the NW WA snowpack? As usual, good to see Cliff following the science and not the hyperbole. The predictions for climate change have been greatly exaggerated by computer models and empirical evidence has not lived up to those exaggerations. Cliff is always careful to note what is real which is very important. Wildly overblown and apocalyptic predictions do little to motivate anyone, especially when they are in the distant future and recent empirical data shows them to be way off. There is far too much at stake in the present for us to squander limited financial resources on unreliable future predictions. "Wildly overblown and apocalyptic predictions do little to motivate anyone, especially when they are in the distant future......"
How exactly can anything be characterized as "wildly overblown" if it is a prediction that has yet to provide feedback? Under what terms do you call any predictions overblown when the overwhelming expert consensus concurs that they are in fact probable? Have you got a crystal ball? 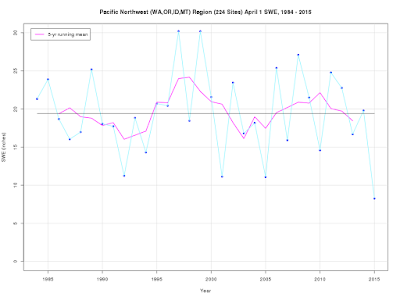 The other is that he states quite clearly that the NW pacific will show a delayed response to rising global temperature, even as the rest of the world shows significant warming already. Again, he says that this muted response will likely "catch up" in the later half of the century at which time we will be well up the proverbial creek without a paddle. There is something particularly notable in JeffB's comments, that is common in the strategies of global warming denial. There seems to be a lack of comprehension, perhaps even deliberate in some cases, in the fact that we need to act now based on forecasts, rather than wait to see if anything is truly "over blown". It is an insinuation that the skill involved in the forecasting is nil, or at least no better than an unskilled guess or roll of the dice. It is an amazing insinuation, considering that skilled forecasting is pretty much the summation of how civilization has advanced through the ages. Best not to cherry pick a convenient inference when in fact he states quite unambiguously just the opposite. Remember that AGW is a forecasting problem, not a now problem, at least in terms of feedbacks. It is certainly a now problem in terms of minimizing risk for our kids. There is something else that might be worth defining, in terms of climate change. Up in our country (which isn't much different than your own) the ski hill study plots also show a similar "steady as she goes" snowpack trend. However what is apparent to the casual observer is that the elevation where the seasonal precipitation transitions from rain to snow is climbing. Above this ever climbing height, the seasonal snowpack shows little variation, but of course below it it certainly has. Our study plots are generally at about 1500 meters ASL. A nearby study plot maintained by Highways dept (Cayoosh pass) is at 1350 m ASL and it has shown a marked decrease in snowpack over the past few decades. As a matter of interest, what are the elevations of the Stevens Pass and Snoquamie study plots? Ignorance has no place here, looking at you JEFFB! Why are you even here, to make yourself look dumb to the rest of us? Bruce Kay: I like your posts, keep it up. They are thoughtful and I agree with a lot of what you are saying. 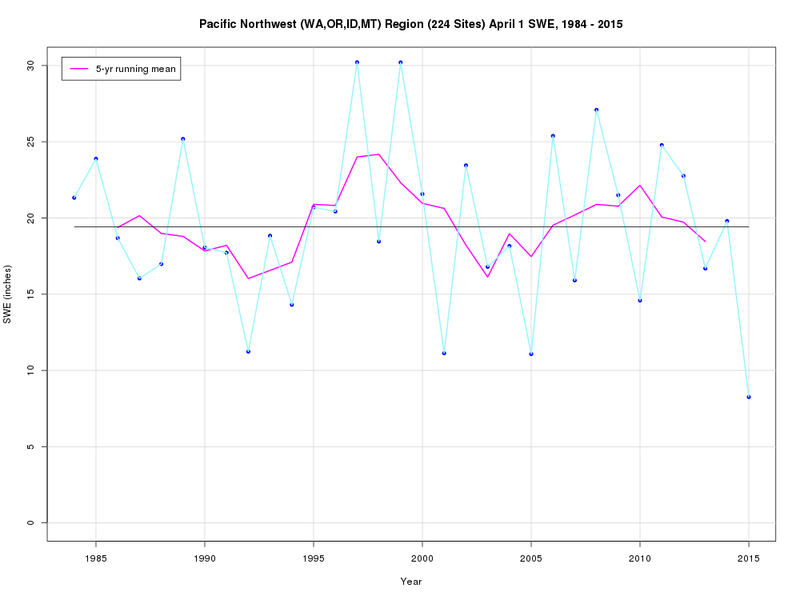 Though given the last two summers and with summer upcoming, it may be possible the PACNW is not going to be slow to show signs of climate change; that is, it may be affected just the same as other places. CLIFF: Opinions are fine, but why do you allow trolls that clearly have no clue and their only reason for being here is to.....troll and write massively unintelligent posts that have no connection to reality. It takes away from the board! @Matt Thompson, who's being the ignorant troll? Everyone is entitled to their opinion, even you. But, the science doesn't back up your alarmist/extremist claims. You need to get out more often and actually interact with people who differ in opinion from you...it can open up your mind and free you from the very narrow vision that you seem to enjoy. The alarmists who post here I would bet have no clue or education in meteorology and /or climatology and just re-post from sources verbatim what agrees with THEIR world view. I for one want true science from Cliff Mass and not politically correct drivel, and he gives that here. Any news on what we might see this coming winter? When will the El Nino/La Nina models start to solidify? Get over yourself Matt T. Your arrogance is insulting! Are you really so above the rest of us, that we should be quiet and listen to you and your followers only? Climate science is about FACTS and REAL data, not computer models that have a hard time figuring out what will happen even 7 days from now! I too am a skeptic of the coming climate apocalypse but NOT a denier. The next 10-15 years will show us much in terms of climate model accuracy. In the meantime, allow data similar to what cliff shared, speak for itself and stop being critical of those who may suggest a different world view than yours. I appreciate the free speech and thought that this blog allows. Keep it up Cliff! And now for a little thing we call induction. There's DE-duction, where based on events that have already happened, we string together the most plausible explanation supported by the evidence we already have. And there's IN-duction, where based on some events we already have, but far from a complete set of observations, we nonetheless attempt to make a plausible conclusion about the cause of what we're seeing. DE-duction works awesome if you're willing to sit and watch something happen, potentially over and over, until a complete picture emerges based on the evidence. IN-duction works best if sitting and watching something happen is potentially a TERRIBLE IDEA, and for purposes potentially including self-preservation, or simply because you're unlikely to get any more data, you use what you have to make a reasonable conclusion. Managing risk is often about IN-duction, not DE-duction in the end. We could wait around until a definitive pattern emerges with melt-out dates, and glacier sizes, global temperatures, etc. and we'd have a TOTALLY DEFENSIBLE reason to actually do something about it. It would also be way too late to do anything that effectively wards off the worst that climate change has to offer. Maybe, just maybe... there isn't actually global warming. Research the energy absorption of the CO2 molecule, and it's properties offer very little impact in terms of being a greenhouse gas. However, good old H2O has a much greater influence on temperature. More heat means more water means more cooling means potentially greater variability in climate extremes, and strength of storms, and does not necessarily preclude an overall change in temperature. "Thanks to you, we've raised $7 million in four-and-a-half months to Save KPLU! "We had six months to do it but you made it happen even sooner, bringing us that much closer to purchasing KPLU and transitioning it to a community-owned station. "This campaign has been an inspiring and humbling experience for all of us at KPLU and Jazz24. We felt good about our work but we had no idea that our community felt so passionate about what we do. Together, we can keep bringing you quality jazz, blues and in-depth news. "Thank you for planning and attending events in the community (there's been over 85 community-driven fundraising events over the past few months), for sharing messages with your friends and family, and for being as absolutely generous as you could possibly be. You inspire us to be even better stewards of this community service. 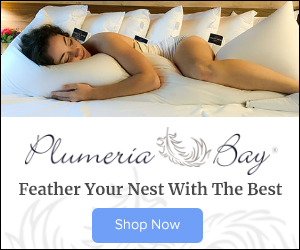 •Negotiate a successful purchase agreement with Pacific Lutheran University. •File a "transfer of license" request with the Federal Communications Commission. "Of course there will be even more work ahead. But we will communicate with you every step of the way and publish weekly updates until we get through the transition. Additionally, new FAQs have been added to the savekplu.org website." When I hear people like Bruce Kay and Matt Thompson using media terms like "denier" (as though our changing climate is some sort of religion that requires "belief"), I tune out that noise and focus on the science that Cliff and his colleagues point to. From looking at that science I can see that humans have contributed to (not created 100%) a series of feedbacks that will likely create a warmer climate to varying degrees (in various places), and perhaps even result in catastrophic consequences IF everything does pan out according to the WORST models. It's good to be preparing for that in every way we can now. Our climate comprises of a big, complex set of systems each with multiple "moving parts" ... and if we don't do what we can now (and from now on), it certainly could be a tough road ahead. That said, the climate does also change on its own (whether or not we influence it), and in past periods of time has warmed to a higher degree than we've ever experienced. It has cycled warm and cool for thousands of years (on its own). So some of this warming is going to happen at some point, naturally, even if we didn't contribute to it at all. I just wrote a comment of a moment nine years ago when opinions that did not go along with the “consensus” on AGW put a scientist’s job in jeopardy. And you now come on here Matt asking Cliff to ban a commenter who doesn’t agree with you? Things don’t change much in this, do they. Wow. Leave it to posters like Matt to once again clearly demonstrate their extreme intolerance over anyone attempting to question their own subjective worldview. In his own little world these heretics must be shamed and ridiculed, or worse if he ever gets the chance. He sounds quite a bit like those who wish to imprison anyone that threatens their own dogma and fanaticism regarding telling everyone else how to live. Welcome to East Germany, circa 1980, and please allow me to introduce you to your new Grand Prosecutor and Torquemada, Matty Thompson. Weatherfreak - it is not about people suggesting a different world view. It is about the facts at hand. The Lower 48 just experienced its warmest winter on record - as did Seattle. Jeff B makes it seem like climate change is something that models predict for the future rather than something that is being observed now. Why, given the clear well documented global warming trend, Jeff B would express great joy in Cliff showing a data set that shows no trend in snow melt date is not clear. "The next 10-15 years will show us much in terms of climate model accuracy. In the meantime, allow data similar to what cliff shared, speak for itself and stop being critical of those who may suggest a different world view than yours." Neel bair commented best on the advisability of waiting anymore than the twenty years we have wasted to date. However, what is most interesting is your suggestion that we "allow the data to speak for itself". I assume you mean, let you and me ( the generally incompetent) judge for ourselves the validity and context of the ever nebulous data. You also suggest that we respect opinion - and equally value that opinion - that is contrary to the expert consensus on climate. The data cannot "speak for itself". The average shmoe lacks the skill to extract meaning from any amount of data. The definition of incompetency is lack of skill required for the task, no matter how much data is at your fingertips. Cliff himself says that such a small data set from the pacific northwest is not a reliable indicator of global climate. If he won't form a judgement about global climate on that little data set, why would we (the less competent) decide otherwise? And if we do, why should anyone respect such an unskilled "world view"? We should be critical of ( better yet, disregard outright) 'world views" that lack both competency in their formation and are not aligned to an expert consensus. That is an appropriate rule of thumb. As people who lack the skill, it would show very poor judgement to do otherwise. If the CEO of NASA or Monsanto did that, it would amount to gross negligence and derilection of duty. To ignore this is to quite predictably fall into the trap of the Dunning Kruger effect, even ( or perhaps especially) if the individual is convinced they possess some skill. Cascade snowpack after Pacific variability is removed displays a relatively steady loss rate of 2.0% per decade, yielding a loss of 16% from 1930-2007. This loss is very nearly statistically significant, and includes the possible impacts of anthropogenic global warming." Since this previous paper (also with Mark Albright) looked at a much longer time-series, I'm not sure why he chose to cherry-pick a shorter period in this case? To stir the pot? It's my observation that Stevens receives a considerable bulk of its precipitation in convergence zone events, perhaps even a lot more than other sites which are not at passes along the central crest. This may be one reason why the site shows such inter-annual variability and why using a mean is perhaps a less useful statistic than others. Regarding this debate, it must be remembered that it is actually harder to predict short-to-medium term weather than to predict long-term climate! Yes, it sounds like a paradox, but climate is about averages, whereas weather predictions attempt to be specific at a specific time. Current climate change models simply say that the averages will change. To my mind the best natural indicators of climate change (or not), and easiest to read, are the glaciers. They provide a sort of "moving average" of snowpack and temperature. I just want to apologize for some of my comments on earlier articles that you have so graciously written. I do get carried away at times. I hope we get some nice rain here in West Seattle soon...my grass is beginning to look like grass would look like in Phoenix in July. The slugs are knocking on my door begging for beer. It is that bad. Looking in BC, I've also found it difficult to detect trends in April 1st snow especially when looking in the near-term parts of those records. Longer-term records show slightly more consistent trends. Snowfall convolutes precipitation and temperature so it's no surprise that a climate change signal is more difficult to pick apart especially given that we expect a bit more precipitation with a warming climate. However, there are detection and attribution studies that have used models to help show that the observed changes in snowpack over large regions is consistent with human influence. Generally speaking, making statements about trends based on 35 years of record in a part of the world that experiences strong decadal scale climate variability is often a bad idea. The period from the early 2000s into about 2013 (the so-called hiatus years) experienced a balance toward more La Nina conditions which have a strong influence on our snowpacks. That phase of decadal varability probably helped tip the trend in the opposite direction to what was expected. I'd be willing to put some money on the line that in another 15 years the trend toward earlier melt-out and lower April 1 snowpack will be much clearer assuming that the recent El Nino is marking a transition back to a warmer decadal phase. We made it to $7m for KPLU!!! Thank you for your advocacy and awareness Cliff!! We did it! Can someone please add some confidence limits to these graphs? I don't think you can come to any sort of reasonable conclusion. Joseph Ratcliff, If you google the term "climate change denial" you will see a very good summary of what that is, ranhing from "ain't happening" to "so what if it is". So, even if you think the term is perjorative, you can't deny that deniers exist so I think it unwise to ignore it if it is the "facts" that you appreciate most....especially if you have no problem with the term "warmist" or "hysterical eco freak". "Is the opinion allgned with the overwhelming expert consensus of what could be described as the most consistently reliable, transparently vetted and highest performing institution of knowledge spanning human history?" It is telling that your response to someone you disagree with is to ask them to be banned. That is to forfeit your argument as you cannot debate with someone who is no longer present. On you not them. And if you are confident your ideas are so superior and self evident, then you should welcome my comments as no threat. I need to clarify. I never meant to imply there will be no future warming or no future climate threat. The truth is we do not know what the future brings. My comment was directed at the predictions over the past 25 years since Climate change and specifically AGW was called out as a potential threat starting around 1990. The models predicted 2.8 to 4.6 degrees C of warming within the century. 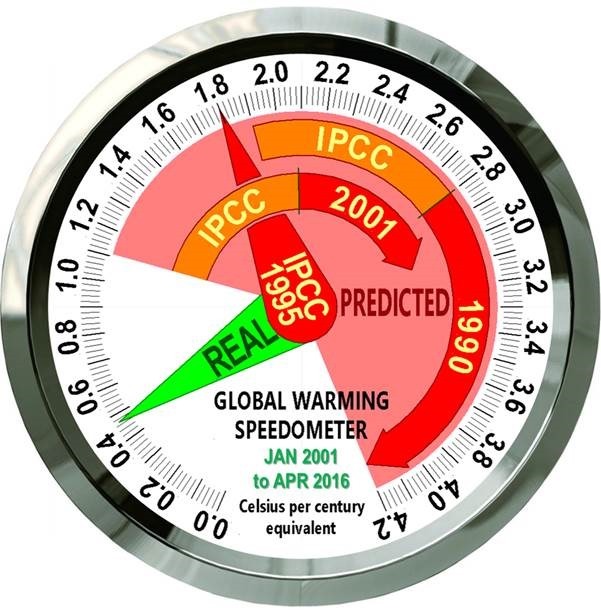 They were revised down to 1.9 to 2.8 C and then again to .8 to 2.1 C warming. But all of those are very high for the empirical evidence over the past 25 years which shows an actual warming of just under .5 C per century. So we are not on a trajectory of alarm. And the predictions were very exaggerated. And I am not triumphantly acknowledging Dr. Mass for the sake of claiming that there will be no potential future risks. Instead I am merely happy to see a scientist who follows the data and is honest about data that actually shows that past predictions are not holding up to reality. We have been told that extreme weather events like hurricanes would increase and they have not. And that the Arctic would be ice free, and this is nowhere near the case. And that here in the PNW, that all of the glaciers were shrinking rapidly and could disappear completely. Also not the case. 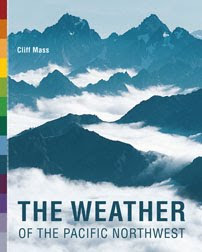 So it seems to me much more rational to listen to scientists like Dr. Mass who frequently downplays hyperbole and specifically mentions where weather and other events are not related to any climate change. Dr. Mass has almost mentioned that for us in the northern temperate zone of the PNW, future warming might be like last summer, which many like myself rather enjoyed. And there are a lot of threats *today* due to the warmer climate near the equator that us North Americans also do not have to worry about. Location, location, location. And, it is clear from polls that the general public now places climate change very far down on the list of priorities and is suffering from alarm fatigue from the many unscrupulous scientists who have issued media-ready ominous climate predictions that have then been proven false. The word "alarm" denotes urgency. And the warming thus far in this century speaks far more to adaptation than to serious alarm. And as I indicated, we do have far more pressing problems in the present that most of your fellow citizens and voters will prioritize far ahead of what *might* face their progeny in the latter half of this century. Might being an important word when models have been so far off for the past 25 years, many will rightly be skeptical of whether they will be accurate for 25 to 75 years in to the future. And, what about cancer, obesity, poverty, religious fanaticism or here in the Sound, big transportation problems? And as I have noted before, none of the alarm confronts the other reality about our future based on history ... that the problems we will face, will most likely be different than what we thought they would be today. And that since resources are always a function of technology, we may well have new energy technology and other solutions that we cannot imagine today. Ask any centenarian if they anticipated the Internet and robotic outsourcing when they were living the great depression in the 1930s. As Cliff Mass often notes, there is no service done to real future climate awareness by hyperbole and alarm in the present. And you like to bandy about the term "denier" But that conveniently ignores that most people act rationally when confronted with a large amount of information about the greater world they face. And that there is a big difference between denial of the future and prioritization of the present that falls well within a reasonable viewpoint. Serendipity strikes again! Here is an article that somewhat coroborates the Stevens pass observations, yet also alludes to the importance that elevation plays in where snow pack accumulates, and where increasingly it does not. Particularly interesting is the implications for wildfire in Whistler, which some amount of "Fire smart" is attempting to address. Just LOLing all the responses here. You guys are correct, there is no climate change. Oh and lets go further and start using the term tree-hugger, libtards, it's all Obamas fault! Isn't that what conservatives always state? The truth is we do know where the future is heading, and only real scared, cowardly types keep harping that things aren't changing. I believe you deniers are AFRAID of change. You want things to keep going as they are, which is not sustainable, especially with population still exploding around the world. The basic problem of economics, learn how to manage a finite amount of resources; but hey that's okay to conservatives right? America is small but deserves to hog the worlds resources. And further, if you opened up your eyes and actually looked outside, keeping an eye on that temperature gauge, you would actually see that things are drastically warmer than before. AND JUST STOP WITH THE BS ABOUT NATURAL CHANGE! While we don't have the whole picture of life on Earth, it is safe to say, with well over 90% certainty, humanity is x factor and the catalyst for this drastic change. A lot of it is all about this selfish ME ME ME society. I need this, I just have to drive that large truck and SUV because I feel MANLY, and gas is cheap now so no worries. And also I need to keep buying a new vehicle every couple years, but who cares if that wastes resources something awful. Some of you make me sick, and I mean that! Ignorance makes me sick. And about preparing for the future? The old adage I apply is "When did Noah build the Ark? Before it rained of course.!!!!!!!" Never seen more ignorance in my life, and the fact I stirred the pot so well....now that is funny. AND YES, TROLLS SHOULD BE BANNED! If you have no clue what a troll is, well all the climate deniers, you only need look in the mirror. Anybody who is trying to peddle garbage science and try to sway others to their opinion should be banned. Here is a suggestion, stop believing all the nonsense you are fed by suspect sources (looking at you Fox News), do some actual research, and do a bunch, comparing sources and seeing what others have to say about said sources. With the internet, there is never a lack of material to find. But hey enjoy sticking your head in the sand. Because when the s**t hits the fan, guess what, you are all going to be looking to somebody else to solve the issue when you could have been doing small things to help with the issue all along. CLIFF: You can delete this line, but I expect you to post my reply, and I would like you to answer some of the nonsense here. Or else you can ban me I suppose if that is what you need to do. Luci: Comes off as disinformation still and that is my point. It is so wrong what people are doing to muddle the issue, and disinformation exists everywhere. The raw data can tell a lot, which Cliff himself uses a lot of it seems. I am not an alarmist, not an extremist, but as I said, the time to change was decades ago and while I am not sure, but it could be at the tipping point or beyond. But in order to change everybody would have to give up something, or many things, and I just don't see that happening. Most of humanity is just completely selfish and self interested, wanting much but never actually getting fulfillment out of having STUFF. Dear Luci, that debate between Hadi Dowlatabadi and Richard Lindzen should be watched by anyone who has yet to see it. Very refreshing...thanks for the link. Rain Off the Coast in Clear Skies?